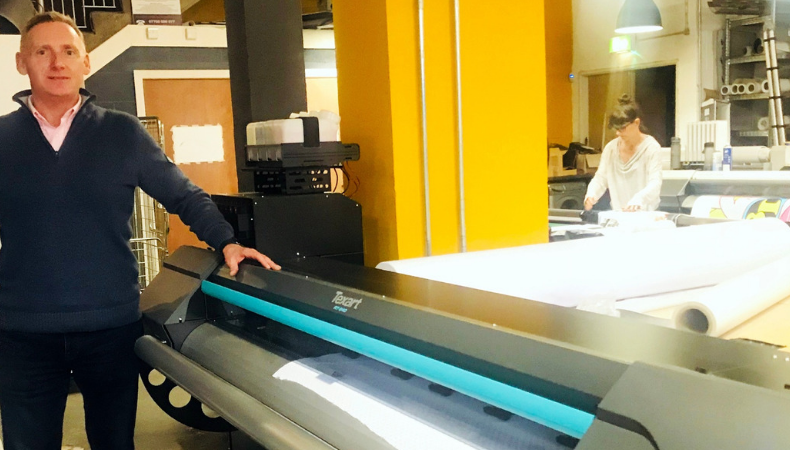 The Nottingham-based firm took delivery of its new multi-function printer – purchased from QPS – in the middle of October in a bid to offer soft signage solutions to corporate customers and boost its turnover. Grangeprint already offers a wide range of services such as canvases, posters, wall art and personalised gifts for the consumer market, as well as business signage, banners, exhibition stands, signs and window displays. Speaking to FESPA.com about the new purchase, Evans said the company opted to return to Roland DG as it already has two Roland RE640’s and a Roland LEF20 UV small flatbed in place, and has nothing but praise for the technology. Although the machine has only been in place for a matter of weeks, Evans said he has no doubt that it will have a major impact on production. He has predicted that the new Roland device will help to increase turnover by around 5% in the first year, past the current level of £1.3m (€1.5m/$1.7m). Evans said: “I started this business with no printing experience; my background was running nightclubs as a general manager for 25 years, and I was always designing the banners and leaflets for many clubs around the country. “So, we started small doing personalised photos on canvas and grew from there, diversifying into solvent printing and then digital press. We also purchased a direct-to-garment printer last month in the form of the new Epson 2100. Looking towards further growth, Evans explained that Grangeprint has recently purchased the free hold on a large city centre location in Nottingham next to the National Ice Arena, which will house it huge arsenal of print kit. This portfolio includes the Roland DG machines, as well as two Canon Pro 6000s, eight Canon IPF8400 devices, three Canon IPF8000 models, Konica Minolta C71 HC digital press, Mimaki JV160 cutter and Duplo DC616 creaser and cutter, among other technology.